The development of cavalry sabres had a great effect on the uniforms worn by the armies of the 18th and 19th centuries. The stiff headdresses, neck stocks, reinforced epaulettes, and tunics of heavy wool, thick cuffs, fur lining, and extensive rope trim (galloon), were all about protecting a soldier or trooper from the blade, particularly a slash delivered at a gallop. A true solid stroke or a well delivered thrust would almost always be fatal, but at least the uniforms provided some measure of protection from off balance, slight, or weak attacks. This article will concentrate on the sabres of the British cavalry, used by the troopers from the 1780s to the Crimean War (1853–56), as these would have been some of the most common blades Kate Tattersall dealt with on her travels. Another article will deal with infantry swords and the Royal Navy cutlass. In the 1600s cavalrymen brought their own sabres, accoutrements, and horses to the battlefield. This was an era of cavaliers – affluent gentlemen serving as the majority of mounted soldiers. By the end of the 17th century, squadrons of paid troopers formed who were supplied by their regiment, often a fabulously wealthy commanding officer paying to equip his men. As armies of Europe grew and became more professional, governments allotted greater funds, and with it came standardization. The weapons would fall into the supply chain, and be churned out through government contracts. Early versions were made in small numbers varying in quality and styles, some of which were straight, some curved. As the century wore on, sabres were mass produced for the troopers, who traditionally fit into a heavy or light cavalry category. The “heavies” (Lifeguards, Royal Horse Guards, Dragoon Guards and Dragoons, and King’s German Legion Dragoons) were all about the pounding, thunderous, overwhelming charge. A long straight robust thrusting weapon suited their purposes. 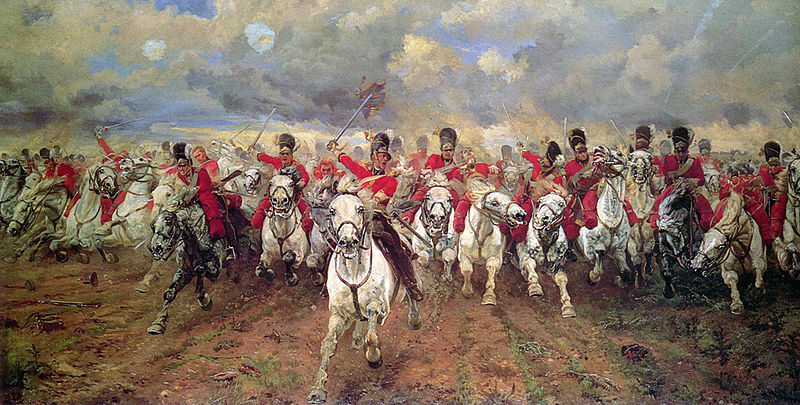 The “lights” (Light Dragoons and Hussars, and King’s German Legion light cavalry) were skirmishers, fast for harassing the enemy, and vicious in a pitched close quarters melee. A lighter curved blade met their requirements. All styles of cavalry sabres were meant to be held firmly in the hand and wielded with determined strength. In 1788 the British Board of General-Officers decided set patterns for heavy and light cavalry would be wise, although wide deviations in this first attempt at standardization resulted. Note: There were hundreds of sabre variations made by different countries, copying each other, making slight changes, so the features I point out about certain weapons in this article would apply to a similar French model, or Spanish, Prussian, &c.
1788 Pattern Heavy Cavalry Troopers Sword. The 1788 Pattern Heavy Cavalry Sword (1788P HC) remained true to earlier styles, and could be described as an all around backsword, except it was much longer than the infantry carried. The very long blade was usually about 37 inches (940 mm), but examples exist of up to 39.5 inches (995 mm). The blades were large, shallowly fullered,¹ straight, with a spear point, and heavy. The bars of the guard wrapped the hand for protection, again similar to the infantry backswords. The grip of the 1788P HC was multi-barrelled steel (perhaps as a counter-weight for the ponderous blade), wrapped in leather, and bound with copper twisted wire. Scabbards were produced in steel, wrought iron, and leather with metal fittings. A nub near the mouthpiece of the scabbard facilitated the use of a shoulder belt and frog, yet again similar to the infantry. A frog in military parlance is a short round sheath of heavy material (leather, canvas, &c) that the scabbard of a long weapon secures into. The scabbard is fashioned with a protruding nub that fits into a corresponding hole on the frog, keeping it from rotating or shifting up and down. The 1788 Pattern Light Cavalry Sabre (1788 LC) may have been created as a copy of European models, and is an example of an early “slashing” British weapon. Blade lengths were from 32 to 35.5 inches (810 to 900 mm) with pronounced curves, fullered, and tapered to spear points. The single bar “D” shaped knucklebow was about as plain as could be, the grip of ridged common wood like pine and beech, and covered with thin black leather applied with glue. The 1788P LC was carried in an iron scabbard with wooden liners, and hung from a waist sword-belt by leather straps (known as sword slings) attached to a pair of suspension rings, a style which would grow in popularity from the late 1700s through to the Edwardian era. Scabbards of leather with metal fittings were produced for officers who opted for such styles. In June 1793, British Major John Gaspard Le Marchant² (1766–1812) attended the cavalry trails amongst fellow European armies, as part of the Low Countries Campaign (1793–95). Le Marchant was an intellectual professional soldier, and considered one of the finest cavalry commanders of his generation. He was horrified at the superiority of other countries’ cavalry over the British, in particular the Austrian, who in turn had adopted and improved upon the Hungarian fast and light approach; the Hussars. Le Marchant studied the methods and weapons of other nations and returned to England with a desire to greatly improve the training and equipment of the British cavalry. Le Marchant copied the Austrian Model 1775 Pallasche as the new British 1796 Pattern Heavy Cavalry Sabre (1796P HC), after failing to convince the “heavies” to adopt a curved blade. It was mass produced and saw service throughout some of the French Revolutionary and all the Napoleonic Wars. The grip was ridged wood wrapped in leather. It originally had a hatchet point, but then often modified by its users into a more common symmetrical spear point, providing a greater ability to thrust. There are large numbers of spear-pointed examples that exist with 33 inch (840 mm) blades, which may be conversions of the original standard 35 inch (890 mm) blade, although many appear to have been manufactured to this shorter length. The sword was carried in an iron scabbard with wooden liners, and hung from a waist sword-belt by leather straps attached to a pair of suspension rings. 1821 Pattern Heavy Cavalry Troopers Sabre. The 1821 Heavy and Light Cavalry Troopers Sabres replaced the 1796 models over the course of a few years. A time of relative peace, there wasn’t the urgency or funds of war. Some Hussar units retained the old dramatically curved 1796P LC longer, and still carried it during the Crimean War. The 1821P HC had a very long 35.6 inch (905 mm) blade, while the light model came in at about 31.25 inches (795 mm), both with fullered blades coming to a spear point. The heavy pattern featured a symmetrical steel bowl guard, while the light pattern had a somewhat asymmetrical but balanced three bar guard for improved protection over the single stirrup style. The grip of both patterns were crafted of ridged wood covered in leather and wrapped with twisted steel wire. It was carried in an iron scabbard, with wooden liners, and hung from a waist sword-belt with straps to a single or pair of suspension rings. Just prior to the Crimean War, the 1853 Patten Sabre was introduced, and intended for both light and heavy cavalry. Metallurgy had improved, providing stronger lighter blades, and Horse Guards felt the 1853P would be ideal for any cavalryman. It was long, 35.5 inches (900 mm), fullered, with a spear point providing excellent reach for a thrust attack, and somewhat curved for the hack and slash of melees, but men complained it wasn’t particularly good for either. The heavy scabbard could be used as a cudgel or shield, and it hung from a waist sword-belt with straps to a pair of suspension rings. The grip was leather, riveted to the blade tang,∗ and a bit smaller around than the men were accustomed to wielding, leading to some complaints that the weapon twisted in their palms. It featured a dramatically swooped three bar guard that improved protection, but limited use to the right hand. Other than the 1788P HC, the regulation troopers weapons had all been designed for ambidextrous use, allowing a combatant to switch hands if wounded, or as muscles tired.† Why Horse Guards decided to move away from this practical approach is unknown. It may have been the standardizing of swordsmanship as per Army regulations which specified everything be done right-handed. 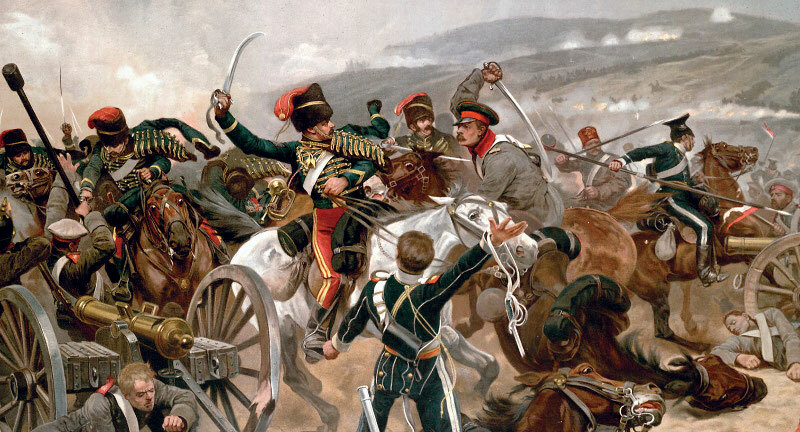 Often the hard learned practicalities of the battlefield are forgotten during times of relative peace, and it wasn’t until after the lessons of the Crimean War that all guards returned to a symmetrical design. The 1853P was the last pattern to have a three bar guard, the ensuing models designed with a cheaper lighter bowl or pierced sheet guard (again, because of advances in metallurgy). It was carried by about half of the troopers who participated in the famous Charge of the Light Brigade, and it continued to be used by some regiments into the 1870’s, but the guards were changed to bowls in 1864. Large volumes were sold to both the Union and Confederate states during the American Civil War (1861–65) and were popular, seeing extensive service. 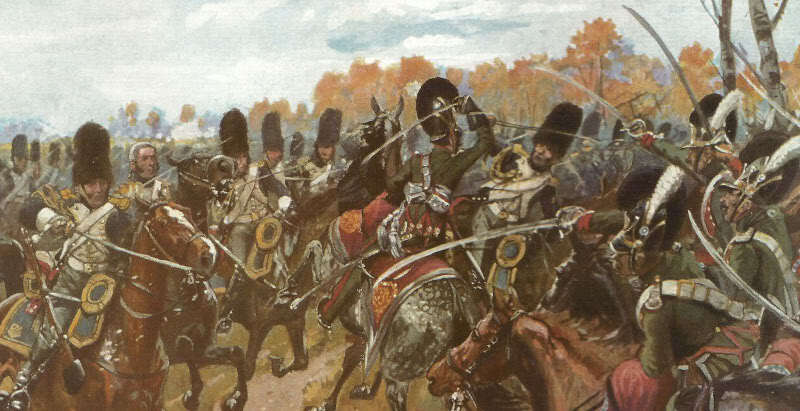 Battle of Balaclava, 25 Oct 1854, the Hussar (trumpeter) at centre wields a 1796P LC sabre (his Russian opponent uses a similar Imperial Cossack model), the unhorsed Lancer in the foreground has a broken 1853P sabre dangling from his wrist by the standard white leather swordknot. There were complaints that the 1853P was prone to snapping on heavy impacts. Note the heavily adorned fur-lined pelisses (slinging jackets) on the left shoulders and arms of the Hussars, providing extra protection on their off-sides. This painting by R.C. Woodville is considered accurate, except the men all wore issue gloves or gauntlets, and the officers usually wore private purchase gloves. About the cavalry officers, they carried different pattern combat sabres akin to those of the trooper versions, but were often lighter in weight and had higher levels of finish and workmanship. The 1821 Pattern Heavy and Light Cavalry Officers Sabres looked similar to the troopers, but were made with pipeback blades, which had very light thin cutting edges and a rod of steel along the back. While nimble, it flexed too easily on the thrust (some times failing to go through heavy wool), and the pipe prevented the cuts from penetrating deeper than the depth of the blade (roughly 1.25 inches, 30 mm). The point lined up with the pipe, at the back of the blade, causing it to jag sideways on contact. The are many examples of officer 1821P sabres with fullered blades (like the troopers pattern) so obviously many pipeback blades were discarded. 1821 Pattern Light Cavalry Officers Sabre (pipeback). All patterns of officers blades usually had some etching, could be better fullered, have decorative langets, grips improved with shagreen‡, &c. Silvering of the guard and scabbard were done to prevent corrosion in wet and humid conditions. Officers of the heavy cavalry also had pattern dress (ceremonial) swords, worn in garrison and for parades, but the light cavalry officers did not. This probably was a reflection of total equipment costs, as the light cavalry uniforms were altogether much more expensive. However, there were many officers who were extremely wealthy, and they had sabres crafted that were lavishly decorated, with etched blades highlighted by blue and gold gilt, bronze hilts, ivory grips, lion’s head pommels, &c.
If you would like to examine further images of British cavalry sabres please consider visiting Antique Swords, where there is also a vast array of weapons from other eras and nations. Note: The horse artillery wore variations of the cavalry sabres, and engineer and logistics officers also adopted patterns for their use. Click here to read a similar article about British infantry swords. ¹ Le Marchant produced a manual of instruction in mounted swordsmanship, and aided in the development of the first British military academy and staff college. He served in the French Revolutionary Wars and the Peninsular War, rose to the rank of Major-General, and died at the battle of Salamanca. ² Fullered refers to grooves running along the flats of a sword blade. It saved on weight while maintaining strength. ³ Langets, from French languet, meaning small tongue, they are metal tabs attached to the guard and fit over the sides of the scabbard, providing a neat quiet fit. ∗ Tang is the portion of the blade that is housed within the haft/handle of a cutting weapon. † There are very rare examples of asymmetrical guards that were modified to make them symmetrical, and some reversed, producing left-handed adaptations. ‡ Shagreen is a word applied to various untanned leather (but dyed any colour) with a granular surface, prepared from sharkskin, horse hide, ray, seal, &c, often used for the grips of weapons. It absorbed sweat and blood while providing better grip. I find these weapons and the artwork very nice, even though it is about death and killing. I don’t get it. Why do we have so many soldiers with PTSD nowadays, when hacking at each other with sabres must have been much worse? @ Sharyl, there are many records of soldiers sitting around moping all day after the Napoleonic Wars. Back then they were known as suffering from nostalgia; a “sentimental yearning for the happiness of a former time.” By the Crimean and American Civil War it was known as soldier’s heart, and was a diagnosis for any vet with depression. There were a lot less survivors from battle, and very little medical treatment, so it wasn’t as well documented as today. The vast majority of common soldiers who returned from warfare unable to function in society would have died in the street or workhouse. By the Great War (1914-18) the condition was known as shell shock, and it was the worst battle fatigue ever experienced. There were varying degrees of treatment; some cruel, some humane. This is well documented, including on film. 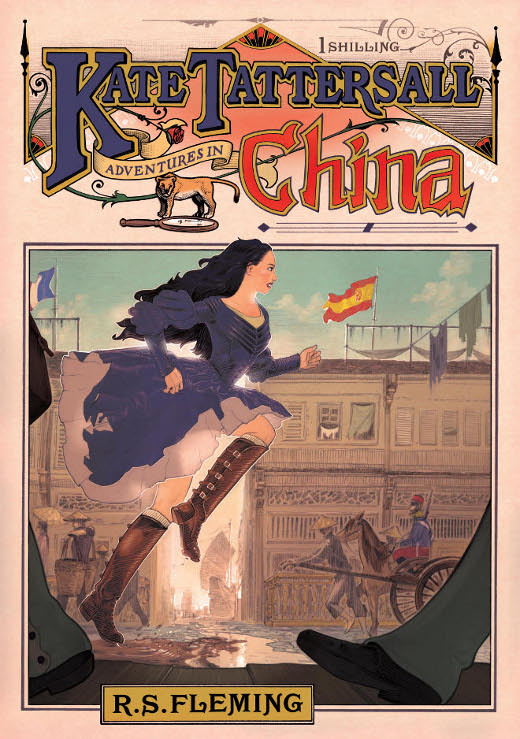 Hello, and nice write up! From the mid-1840s through the balance of the Victorian period, a number of officers chose to carry non-regulation swords, and some regiments had their own special pattern swords. These types are too diverse to discuss in a blog comment! For further reading on the subject I recommend “The British Cavalry Sword 1788-1912: Some New Perspectives” by Richard Dellar. I hope my input was helpful! As a historical note the trumpeter of the 13th Light Dragoons (the Light Brigade) was actually riding a bay during the Battle of Balaclava. “Greys” were the standard mount color for trumpeters, but the horse’s color was of less importance than its ability to keep up with the officer who would be ordering the signals. Because of that, the trumpeter was always mounted on the best or second best horse in the unit. Other historical bits include the horse was a mare from Ireland, her name was Butcher and both she and her rider were wounded during the charge. She continued to be one of the favorite mounts of the 13th LD until she was retired. At retirement she was sent to Windsor Castle where “the Balaclava mare” remained until she died. In the peculiar sentimentality of the Victorians, when the mare died Queen Victoria had silver chased ink wells made of her hooves, one of which was given to the family of the trumpeter. I own a wonderful 11th hussars 1821 sabre from the Crimea. My godfather Charles Martyn is considered somewhat of an expert and his books may be of interest. I admire your work. Very interesting and great to read. My father was in the 11th Hussars, a great regiment with an amazing history. Thank you for keeping it all so alive. Really appreciate you sharing this blog post. Much thanks. Awesome.